Things are still unfolding as far as the Confido ICo is concerned. It is evident the developers raised money for a project they never intended to finish. However, it seems investors may still get their money back. A new letter has surfaced which may be either legitimate or completely fake. In the letter, there is a claim of how the ICO funds are frozen in a trust fund until further notice. It is difficult to say whether or not this letter is genuine. It bears all of the marks of an official law firm. Then again, we have seen scams fake such paperwork in the past. It wouldn’t be beyond the Confido team to pull people’s leg in this regard. Moreover, the letter itself seems somewhat professional, but it still raises a lot of questions. Assuming this letter is fake, the team is getting themselves into a whole new sort of trouble. Impersonating a law firm is absolutely not done. Then again, it does appear the Confido ICO investors will get refunded. This letter claims there is a concern over the “rumors” regarding this project. Moreover, they claim the project is not feasible within the scope of the results of the ICO. A strange way of putting things, as it confirms this project should have never been created in the first place. Anyone doing a bit of research saw that coming when the project was first announced. It also appears the team has received some death threats. That is not entirely surprising, as people are quite displeased with this scam. For all intents and purposes, that is the only way to describe this ICO until investors are refunded. The team also took down the website and all social media accounts. More evidence of pulling an exit scam more than anything else. It also makes this letter seem even more dubious. How things will unfold for Confido, remains to be seen. While this may have been an overly ambitious team, a lot of money is still missing right now. It is unclear how and when the money will be refunded in the coming weeks and months. The updates will be posted on the website, which was taken offline a few days ago. A very strange way of resolving this matter, to say the very least. Investing ICOs remains a big risk, that much is certain. 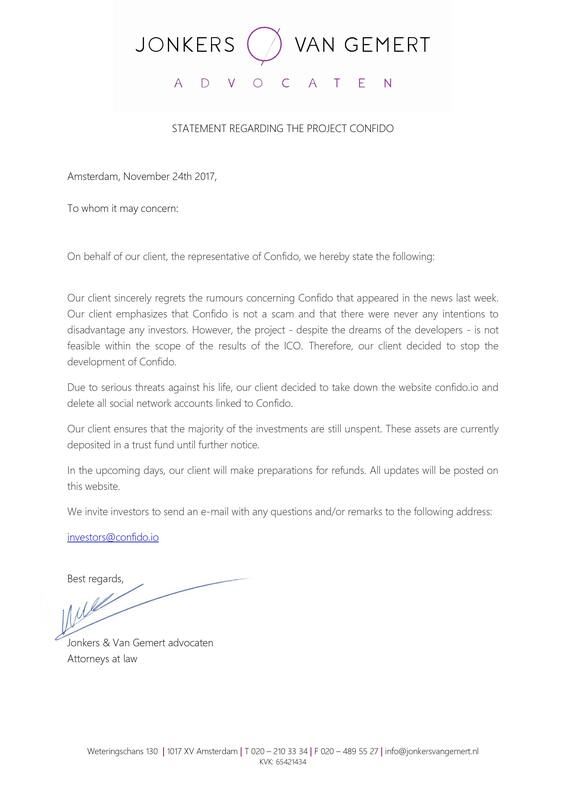 The post Confido may Refund ICO Investors After all, According to Dubious law Firm Letter appeared first on NEWSBTC. The post Confido may Refund ICO Investors After all, According to Dubious law Firm Letter appeared first on bitcoinmining.shop.